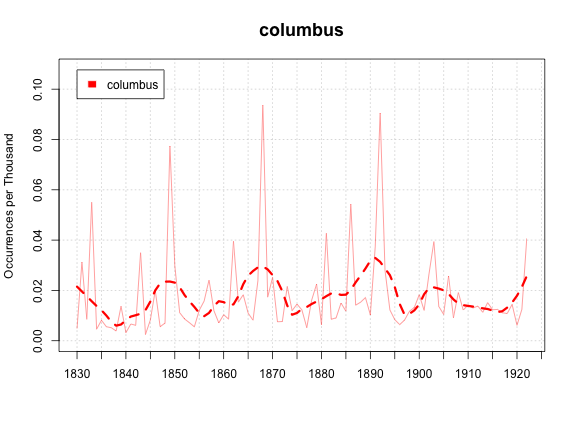 Sapping Attention: Centennials, part I.
I was starting to write about the implicit model of historical change behind loess curves, which I'll probably post soon, when I started to think some more about a great counterexample to the gradual change I'm looking for: the patterns of commemoration for anniversaries. At anniversaries, as well as news events, I often see big spikes in wordcounts for an event or person. 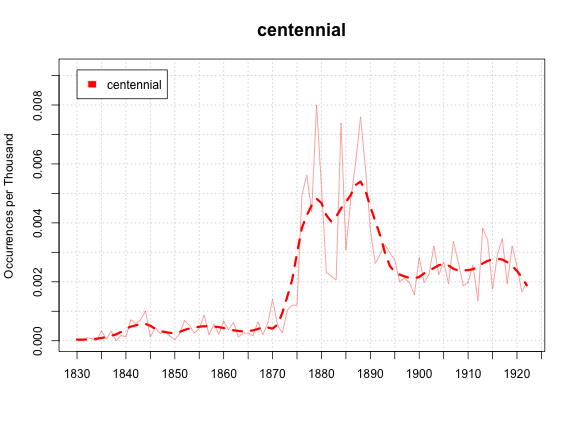 So that's a start: the word centennial was hardly an American word at all before 1876, and it didn't peak until 1879. The Loess trend puts the peak around 1887. So it seems like not only did the American centennial put the word into circulation, it either remained a topic of discussion or spurred a continuing interest in centennials of Founding era events for over a decade. If MySQL ever finishes building an index for me (9 hours and counting), we could look year by year at words in a sentence with "centennial" to see whether it's Yorktown and the Articles, or if it's still just discussion of "The Centennial. "And then after the centennial, the word remains in the vocabulary in a way it wasn't before. Maybe it wasn't the civil war, it was the centennial that sparked commemoration? 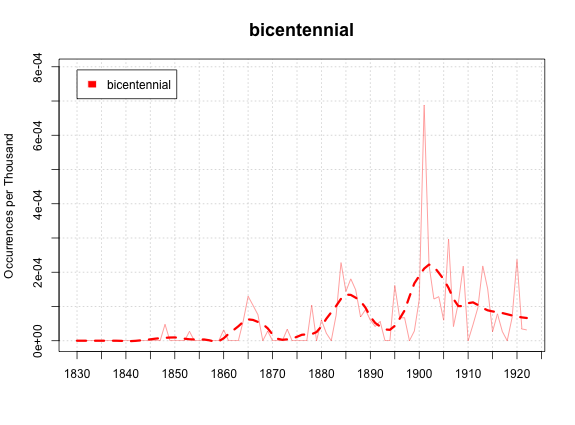 "Bicentennial" isn't pushed into popular use by the New York City bicentennial in 1865, but it does rise some around the time that 'centennial' peaks. Are there any major bicentennials in 1883-1888? The biggest peak here, so far as I can tell, is the Yale bicentennial in 1901--the database should let us see who it is that drives that spike, if we're curious. What about the columbus quatercentenary? A definite spike in 1892, but not nearly so big as I'd have thought. Did the city do something in 1868? 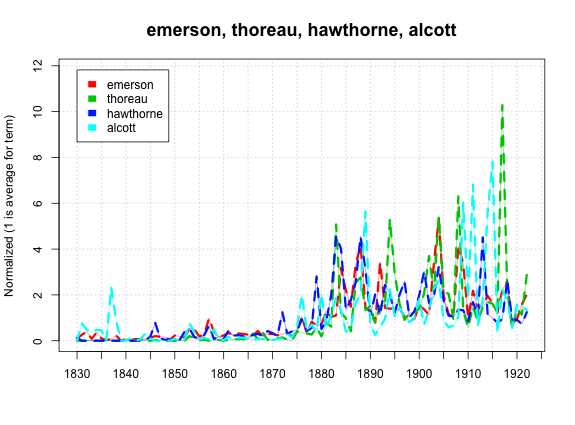 The single largest peak there is for Thoreau's centennial. More than 1 in 10 mentions of his name happen in 1917. So the question arises: Is that a big centennial peak? The conditions seem right--increased relevance due to the war; it's after the Civil War commemorations so anniversaries are fresh in mind, and Thoreau is an author whose reputation has only risen. Are there patterns in big commemorations like that? I've got one idea I want to try, but I'll save that for the next post. Part II, with centenary peaks for authors and presidents, is here.